Sharp mind and technical know-how helped Prathima Devi, 25, a class X graduate, resident of Manichak village in Barachatti, Bihar become a mentor for the villagers. Born in a family of farmers in village that depended solely on farming, Prathima helped her family in farming on a small piece of land. Thanks to her curious nature and ability to absorb technical knowledge, Prathima is now a ‘field officer’ and helps other villagers to adopt smart farming techniques. Currently, she is training 46 farmers and helping them shift to data-aided farming practices. “I had completed my class X in 2014 and was helping my family in farming. In 2017, a team from NGO visited the village and conducted training sessions for which I was selected from my district. The team gave me a smartphone connected to a ‘weather machine’. Through this phone we get regular alerts on weather conditions, health of crop and we could connect with the team in case of any doubt. 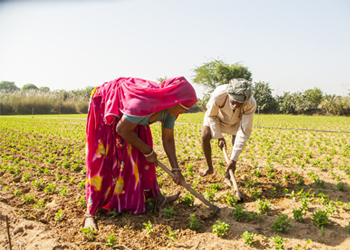 Based on these inputs I can further train rest of the farmers,” said Prathima. Currently, every farm in the Bihar village is using the weather machine. The technology has reached over 10 lakh farmers across India. It was adopted by the government of Karnatka for its farmers and used by the World Bank to reach remote locations of Bihar, Uttar Pradesh and also being adopted by some parts of Madhya Pradesh and Jharkhand. The machine detects the geo-coordinates of an area, to help farmers understand the crop type, its health, soil type and other weather conditions. This generates alerts on phone of around 10,000 local field officers including Prathima who then alert other villagers. The machine also senses data of every farm and generates warnings for untimely rain or adverse weather conditions and also issues alerts for farm-diseases or pest attacks. Currently, 10,000 farmers are working as field officers, most of whom are children of farmers who have passed class X or XII. Prasad claims that the technology has increased the productivity of UP’s sugarcane farmers by 20% under an initiative by World Bank. The technology has the potential to decrease the farm losses caused due to adverse weather or disease spread by 15-20%, he claims. As per the new farming practices, several farmers have changed the irrigation pattern and are introducing quality seeds for better yield.